Hindsight is 20/20. Maybe you wish you’d studied harder in school, or maybe you should have spent more time just being a kid. You shouldn’t have taken that job. You shouldn’t have this. You shouldn’t have that. You even blame yourself for getting tinnitus. Was it all of those loud concerts? Was it the Walk-man permanently affixed to your hip? Could you have worn earplugs? Stop it! The fact is that you have tinnitus. You can’t get rid of it, although there are treatments that will make it better. It’s time to focus on the present and living the most meaningful life now. Your worrying may even be making the condition worse. Let’s look at how anxiety and depression can impact tinnitus and what you can do to stop this cycle of “should-of’s” controlling your life. Much research has been done to link tinnitus and mental health disorders. While you may think that the tinnitus causes anxiety, it may just as easily be anxiety or depression making your tinnitus worse. In fact, one study found that tinnitus is strongly linked to how we process emotions. This may explain why tinnitus can bring about such strong emotional feelings. Study participants were asked to listen to a series of sounds. Some were pleasant sounds like a babbling brook or a kind voice. Others set out to evoke emotion like a baby crying, a car horn blaring or Cold War siren. With a fMRI they studied how the brains reacted. Those with tinnitus processed sound-related emotions in a very different part of the brain than those without. This is not to say that anxiety causes the tinnitus. But it does help explain how anxiety and depression, which are associated with strong emotions, can make the condition worse. Relaxation methods like deep breathing, meditation, yoga or other activities that help you relax can reduce your symptoms. Exercise improves blood flow in your ears, brain and throughout the body. That means cells are getting more of the life-giving oxygen and nutrients they need. It also helps balance hormones like the fight or flight hormones that can contribute to anxiety. You may not even realize that you have a negative script running through your thoughts every waking hour and much of your sleep time. If you frequently think about not having enough of something, blame yourself or others for things or have “what-if’s and “I should have’s” running through your brain, it’s time to flip the script. Think about what you’re grateful for. Take pleasure in small victories and moments of joy. Acknowledge all of your achievements in life. Commit to writing down five things every day that you’re grateful for. The more you focus on the good stuff, the more you’ll realize how much good stuff there actually is in your life. You’ll find that you receive more of it when you start looking for it. Even the people around you will often start acting differently. Your tinnitus might not get better immediately. You might slip back into a state of worry. Just keep working at it. A doctor will hook you up to sensors. You’ll focus on controlling various involuntary functions like breathing, heart rate, muscle tension, etc. A doctor may have you listen to a series of sounds that, over time, can reduce the tinnitus symptoms. Untreated hearing loss has been closely linked to anxiety and depression. 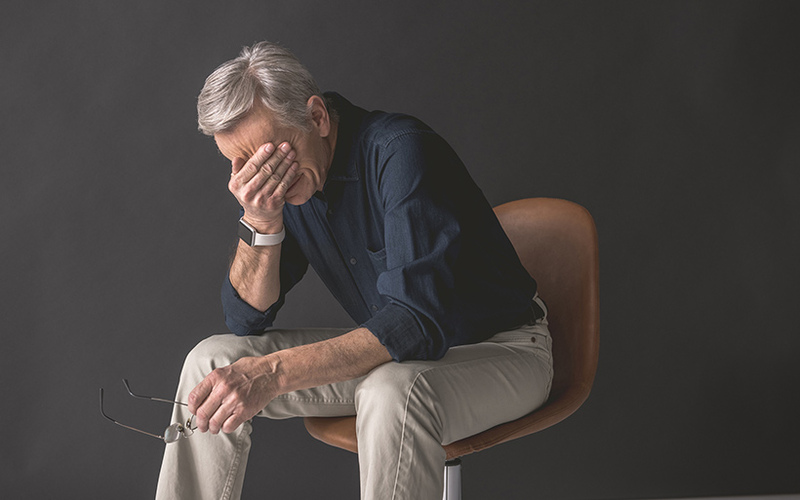 Those with untreated hearing loss are 50% more likely to have depression symptoms than those who wear their hearing aids. They were 30% more likely to have anxiety. Wearing your hearing aid may not only reduce some mental health symptoms. A hearing aid can also be set to emit a sound that helps reduce tinnitus. Your audiologist will be able to work with you to find solutions that reduce your tinnitus symptoms.